Newport Beach, California is known for its upscale shopping and fancy restaurants, but its real charm lies along the coast. Where the city meets the Pacific Ocean, the Balboa Peninsula reaches out like a skinny finger from the mainland. It creates a natural harbor dotted with seven small, humanmade islands. Coastal Newport Beach is a quiet, relaxed place where you're more likely to meet the harbor patrol than the highway patrol, and you may hear more birds than automobiles. If you get off Pacific Coast Highway onto Newport Beach's Balboa Peninsula and Balboa Island, you'll find a little pocket of old-fashioned charm has managed to persist just blocks from the busy city nearby. It's a place where the kids still run around in summer like they did in the 50s and everyone seems laid-back and calm. In fact, they're so relaxed that it's infectious, and a couple of days here can do wonders for a bedraggled spirit. Newport is also lots of fun at Christmas time when you can watch the affluent oceanfront community's version of a small town Christmas parade, featuring lighted boats in the harbor. Visit Balboa Island: You can drive to Balboa Island directly over a bridge, but if you're on the peninsula, take the ferry instead and go for a walk. Balboa Island's streets are lined with cottages arranged in neat rows. Marine Avenue, the island's only shopping area, offers a variety of wares, from handmade kites to resort wear. Go To Balboa Beach: Some people think Balboa Peninsula's beach is one of the urban beaches in the country. 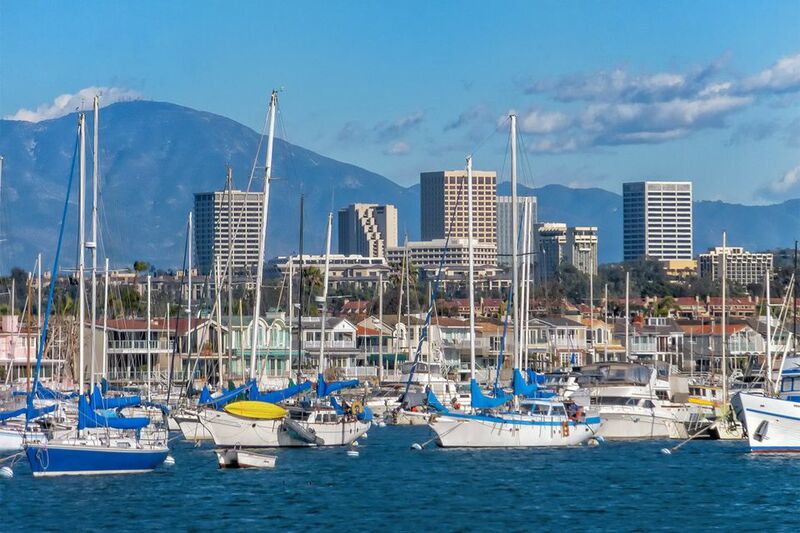 Whether to spend your time on the ocean side or harbor side could be the most difficult decision of your day. The Wedge, at the ocean side tip of Balboa Peninsula, is famous for bodysurfing. Nearby, Corona del Mar State Beach sits below protective cliffs; the sand littered with beachgoers. Take a Walk on the Pier: Newport Beach has two piers to do it on. The Balboa Pier is near the Fun Zone on Balboa Island, and the Newport Beach Pier is just a little north where early risers stop by the Dory Fleet Fish Market. It opens at 6:30 a.m. when the fishermen bring in their catch. Take a Harbor Cruise: Float past waterfront homes, each with a private boat dock, and listen to the captain's gossip-column stories of today and yesterday. You'll pass cottages so small you'd have to go outside just to change your mind and million dollar mansions divided by sibling squabbles. The Fun Zone Boat Company is the best way to go. You can also take a sunset dinner cruise with Hornblower Cruises. Get in Some Water Play: Go parasailing with Balboa Parasail. Or rent a water toy, jetski or stand up paddleboard from Balboa Watersports. The Wedge at the end of the Balboa Peninsula is popular for bodysurfing, while traditional surfers cluster near the Balboa Pier. Stroll at Sherman Library and Gardens: Don't let the name fool you - it has more plants than books. This little jewel box of a garden is the perfect place for a relaxing stroll. Rent a Duffy Boat: Invented in Newport Beach, these cute little boats were designed to be quiet, ecologically friendly, and easy to operate in the calm water. Duffy of Newport Beach is the original company, but you can also find them for rent at the Balboa Fun Zone or on the island. October: An evening stroll past the waterfront homes between the peninsula and Balboa Island to see the Halloween decorations feels like walking through a lighted carnival midway. December: The Newport Beach Christmas Boat Parade is a long-standing tradition that's well worth your time. Newport Beach is a relaxing place filled with simple pleasures. Watch the sunrise on the beach, and have breakfast at a nearby cafe. Stroll hand-in-hand along Marine Avenue on Balboa Island. Take the walk-on ferry over to the Balboa Fun Zone and win your sweetheart a stuffed animal. Go on a romantic gondola ride. Some locals don't even know about Newport Beach's canals, but they make a perfect place for a sunset ride which you can take with Gondola Adventures. A Duffy boat ride for two is extremely private, and a great idea for a marriage proposal. Or for a romantic evening out, use your Duffy to enjoy a Dock and Dine experience at these restaurants. Local parents say their kids love to take the little ferry from Balboa Island to the peninsula. When you get to the peninsula, they'll enjoy the Ferris wheel and amusements at the Balboa Fun Zone. The whole family can rent bicycles, family cruisers, or electric bikes and enjoy riding around town. The playground at Marina Park is also lots of fun. And the Lighthouse Bayview Cafe there is super casual, with outdoor seating with a view of the harbor. Newport Beach is the home of the Balboa Bar. That's an ice cream bar on a stick, dipped in chocolate when you order them and rolled in crunchy coatings of your choice. Two competing stands sell them, and both also claim to be the home of the "original" frozen banana. Not every hotel in Newport Beach is right on the sand. Before you run off to search for a hotel on one of those online booking sites, find out how to find your perfect hotel in Newport Beach. Newport Beach is in southern Orange County, south of the John Wayne/Orange County Airport. It's 44 miles from downtown Los Angeles, 428 from San Francisco, 430 miles from Sacramento, 90 miles from San Diego and 277 miles from Las Vegas. To get Balboa Island, set your navigation to 124 Marine Ave, Newport Beach, which is the local fire station on the main street. To get to the peninsula, set it to Balboa Pier.